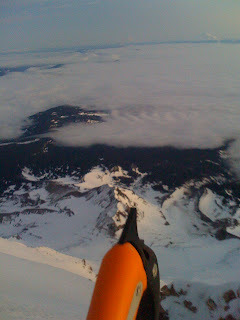 This was a Solo climb of the W. Crater Rim. 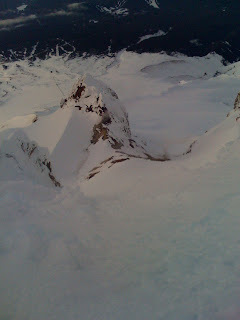 I've wanted to climb this route for awhile, but its AVY prone so stable snow is key. The "snow" was as stable as concrete. The route description calls it +/- 50 degree snow, mostly less than 45 degrees. Well that's not what I found. There was no snow, all ice and it was steady at 60 degrees w/ bulge that was closer to 65 degrees. You could have possibly found some lower angle snow in the gully between Crater Rock and the W. Crater walls, but that was no mans land. There were rocks peppered in that area and I didn't like the idea of walking through there. The recent death of the woman who was struck by ice shook me up a bit. Last year, I was climbing one of the gullies between the Mazama Route and the Pearly Gates. The climbing was more difficult than I anticipated, therefore, it took me longer than I was planning. As the sun hit the snow, it started to sluff off. I noticed a bit of snow balling so I decided it was time to turn back. When I got to the Hogsback, I was relieved to be off of the AVY terrain. 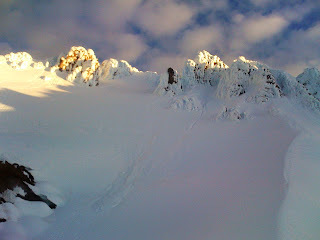 Below the triangle moraine, I talked to a girl who was still going up, I told her I turned back because of AVY danger. She continued up. From the Palmer, I could see her working her way up the steeps to the summit ridge. I didn't see her in the paper the next morning so I figured all went well. Maybe I should have kept going? A couple weeks later, I ran into her and her husband while I was on the way down. (near the top of the Palmer) They were still headed up. I hoped her lateness wouldn't catch up w/ them. Eventually it did. As Vincent noted earlier, sometimes the difference between prudence and wrecklessness isn't an attitude, its a couple of hours. I'm sure she'd want us to learn from her mistake. If its going to be warm, be early. 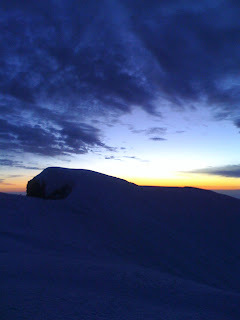 When I reached Crater rock, it was real icy but I didn't hear any ice falling. It was still real dark and there was no moon, as matter of fact I felt like I was on the moon. I began working my way up and right along the Crater Wall. It was definite 2 tool terrain. The ice was unlike any I'd ever seen. It looked like the scales of a fish. Scalloped/Serrated. It offered great purchase for crampons and ice tools. I reached a bench of lower angled stuff about a third of the way up. I took a break and waited for a bit of sun light. It was still pitch black and I wanted to have a better idea of where I was headed. I was an hour earlier than I'd planned. After a few minutes, I could see well enough. I started out onto the upper crater wall. After about 30 feet, my right boot began to loosen. Because of the steepness of the terrain, there was nothing I could do. Atleast there was only another 700' of front pointing! As the sun brought a little more light, the feeling of being on the Moon slipped away w/ the darkness. 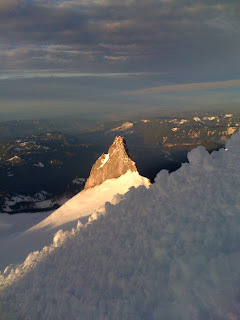 With the light, I could see that I was securely (sort of) grounded here on our very beatiful, Mt Hood. I walked across the summit ridge. Somehow it felt wider than usual but I suspect I'm just getting stupider. (is that a word?) When you start down climbing, face in, you always wonder how you got up this thing anyway. When I was back at the Hogsback, I looked at the Devil's Kitchen Headwall and considered heading up it. It was still pretty early after all. For some reason, I flashed back to the night before when I told Amy I'd be safe. It didn't feel unsafe to start up a new route but somehow, it just felt like the wrong thing to do. Besides, that loose boot gave me a blister that I'm still dealing w/ 2 weeks later. How many times have you been on a mountain and just craved a nap? I placed my tools in a manner that would keep me from "rolling out of bed" and I dozed. The Alpine Nap, nothing like it. When the sun hit my face I woke up. I expected to see the masses heading up. I peaked down and saw no one, it was only Friday afterall. Even though the weather was perfect (cold and no wind) for climbing, I suspect, many people couldn't justify heading up the Trecherous Mt Hood. I also suspect that many climbers spouse's werent' going to let it happen. 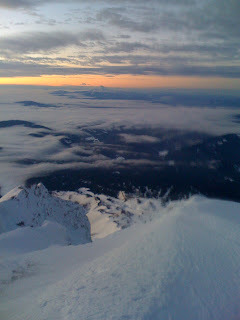 Sitting atop my very own Volcano, not another person in sight, I was overcome by feelings of greatfulness. To have good health, good weather, a mountain less than 2 hours from my bed and more than anything, a wife who lets Jess be Jess. Illumination Rock, I wonder why they call it that?